So pleased my grandson,Emmanuel,has passed all his first year exams at Birmingham Uni.We'll be fetching him, and all his gear,home on Monday. Beautiful, I want to move in, it looks like a lovely place! Wonderful !! love it ! This is so cute, it doesn't look real! Where are the Munchkins? Such an English cottage garden - almost makes me feel homesick - but not quite...... Fav. Great capture of a quaint looking cottage and I love all those flowers. This looks so romantic. Love the roses. Fav, Carol. What a pretty cottage Carol, beautiful capture. FAV. Very pretty! What a lovely home. Congrats to your grandson! What a lovely cottage - Fav Great news about your grandson. It makes you really proud doesn't it! A very nice house indeed.....well cared for & the roses are a stunning addition. So pretty, so English. fav. My dream home. Hope it is as pretty inside. Congratulations to your grandson. One of mine is celebrating his 21st birthday today. Time flies. This could be from a model village it's so perfect. Well done to your grandson. What a wonderful cottage! Great capture! This is like it's from a fairy story. I LOVE it! A very sweet looking cottage. 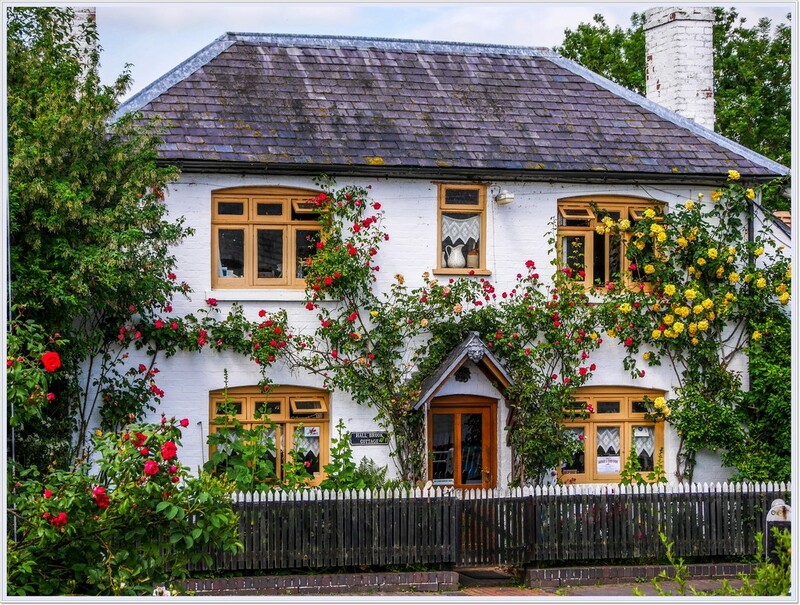 What a gorgeous cottage, love all the climbing roses! This is a beautiful cottage. I love all the flowers growing around and on it. Goodness, first year exams already! Where does the time go! Congratulations and well doen to Emmanuel. Pretty capture, Carol - so quinitessentially English with the roses round the door. The lace panels look like the ones they used to hang in nb windows, so maybe the owners are ex narrowboaters. Lovely -- and great to see on TT! so sweet. My grandparents lived in a town called Foxton. Nothing like this though!! Carol...sorry I missed this. Congrats for making TT..well deserved! Congratulations Carol on this finishing in the Top Twenty for the week! It is very well deserving! Fav! Ooh which subject? My daughter is about to graduate in psychology - staying on for another year for a masters and the joys of Selly Oak! Lovely cottage. @judithg. He's studying Nuclear materials and Engineering, hopes to do a Masters eventually. He's living at QI, Five Ways, very nice, overlooking the canal.